Organizational Behavior, Gerontology, Abnormal Psychology & Research. 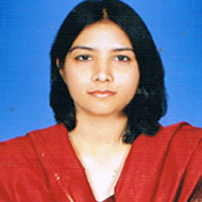 Dr. Shrruti Sahrawat has a teaching experience of approximately 20 years. She did her Graduation from Lady Shri Ram College, Delhi University, Masters in Applied Psychology and PhD in Psychology from Delhi University. Her areas of interest are Counseling, Organizational Behavior, Gerontology, Abnormal Psychology and Research. 1. Chapter – Changing Values among the Indian Young and old, in the book ‘Think before Getting grey’, Edited by Professor N.K.Chadha, Printed by Shri Sai Printographers, Delhi India. 2004. 1. Appointed ‘Session Chair Psychology’ by American Society for Business and Behavioral Sciences, for their Annual Conference at Las Vegas USA. 2009. 2. Appointed ‘Track Chair Psychology’ by American Society for Business and Behavioral Sciences, for their Annual Conference at Paris. 2011. 3. Leading Newspapers like Pioneer and Hindustan Times have published her articles on psychological issues. 2007. 4. She has been invited as an expert by News channels like Zee News and Total TV to discuss on psychological issues. 2007.